It was not Charles Dickens, Victor Hugo, or even Karl Marx who penned that sentence. It was Pope Leo XIII in “On Capital and Labor” (Rerum Novarum, 1891), an encyclical (papal letter) inaugurating a series of documents we now refer to as “modern Catholic social teaching.” As industrialization and urbanization came to the Christian West, the churches of Europe and the Americas felt compelled to respond to the new problems of an industrial world. It was natural that Roman Catholicism, the West’s largest body of believers, was on the frontlines of this response. The Catholic Church possessed a highly developed system of social institutions (hospitals, schools, orphanages, and the religious orders that served them). It also had an extensive system of intellectual institutions (seminaries, universities, and publications). Its response was therefore both practical and theoretical. The challenges presented by capitalism and socialism absorbed the attention of some of Catholicism’s best and brightest minds in this new era. Ozanam urged charity motivated by genuine Christian love rather than guilt or paternalism. He saw service of the poor as a profoundly spiritual encounter with Christ himself. Confronted by the poor, he said, “We should fall at their feet and say to them with the apostle: ‘My Lord and my God. . . . You are for us the sacred image of the God that we cannot see. Since we know not how to love him otherwise, we will love him in your people.’” Ozanam’s vision inspired millions of followers and provided renewed vigor to Catholicism’s ancient, but sometimes neglected, spirituality of social action. In Germany Wilhelm von Ketteler (1811–1877), bishop of Mainz, advocated cooperation among capital, labor, church, and government to ensure that the needs of the poor and laboring classes were adequately addressed. A convert from Anglicanism, Manning used his position as archbishop of Westminster to promote the rights of workers; his most famous intervention brought about the settlement of the Dock Strike of 1889. Manning communicated with his friend Pope Leo on the labor question, and Leo asked Manning to translate Rerum Novarum into English. Following this, labor organization as an expression of the right to freedom of association became an important theme in the Catholic Church’s social teaching. Manning’s vigorous assertions of solidarity between the church and the working classes initiated a tradition of intense Catholic skepticism about the benefits of capitalism. In the early twentieth century, some of the most popular English Catholic intellectuals of the day—Vincent McNabb (1868–1943), G. K. Chesterton (1874–1936), and Hilaire Belloc (1870–1953)—advocated an approach to economic life they called “distributism.” (See CHM #75, G. K. Chesterton). Distributism had a small following in the United States, where American Catholic social thinkers displayed nearly as much variety as their European counterparts—although they avoided the most radical approaches such as socialism, fascism, and monarchism. (Catholics, whose national loyalty was sometimes suspected, wanted to be “good Americans,” after all.) Distributism remains an important strain within Catholic social thought, though its proponents struggle to show how a path toward universal ownership would work in practice, distinct from both existing market systems and state socialism. Cardinal James Gibbons (1834–1921) of Baltimore proved that the church in the United States would be fundamentally sympathetic to working-class concerns when he intervened in Rome in 1887 to ensure that the Knights of Labor—an early American union led at the time by a Catholic, Terence Powderly (1849–1924)—would not be condemned by the pope. Owing to the historical conflict between freemasonry and Catholicism, the church did not tolerate Catholic participation in “secret societies.” Gibbons’s task was to assure the pope that the Knights of Labor was not such a society. The most prominent American advocate of Catholic social teaching in the first half of the twentieth century was Monsignor John A. Ryan (1869–1945). Ryan, a longtime professor of morality at Catholic University of America (Washington, DC), was also the inaugural director of the Social Action Department of the National Catholic Welfare Conference. Ryan was in large part on board with the New Deal policies of Franklin Roosevelt in the 1930s, and he reminisced in 1941 that “practically all the reform measures enacted during the Roosevelt administration have met with my hearty approval.” But what sometimes set Ryan apart from his Progressive allies—and what united him with fellow Catholic thinkers across the political spectrum—was the central place he gave the family in his social thought. Ryan viewed the church’s teachings against birth control and for a just wage as complementary pieces of a consistent social ethic. His ideal: a household composed of a mother and multiple children, supported by a breadwinning father. Many figures within the American Catholic community paid heed to such warnings. Scorched by the policies of the Kulturkampf—the 1870s campaign by Prussian prime minister Otto von Bismarck to suppress Catholic influence in public affairs—socially minded German Americans were wary of the abuses of government power. Frederick Kenkel (1863–1952), head of the chief German American institution of Catholic thought, the Catholic Central Verein (CCV) in St. Louis, wrote as early as 1933 that he detected in Roosevelt’s New Deal agenda a drift toward “the bitter end of State Socialism.” The CCV criticized the American economic system for its failure to reflect Catholic principles of justice, but it also believed that government expansion in the 1930s represented a serious threat to personal freedom, as well as to families, churches, and other groups that stood between the individual and the state. In the end, identifying a “party line” within Catholic social teaching is impossible. 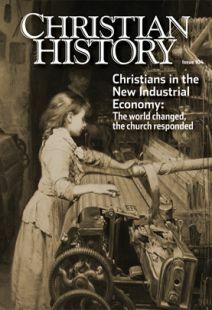 Catholic intellectuals agreed that Christians needed to confront the implications of industrial society. Still, the matter of interpreting and applying the church’s teaching remained in many cases far from simple. All this attention devoted to social and economic problems by popes and intellectuals may leave the impression that the bulk of the church’s efforts were theoretical. In fact, the opposite is true. The practical Catholic response to industrialization was forceful, especially in the United States. European immigrants dominated American Catholicism after 1840 until at least the 1920s. Irish- and German-born bishops were in charge, and they focused the church’s resources—meager as those were—on providing for the spiritual and material needs of their immigrant brothers and sisters. For millions of Catholic newcomers, the church was the first step up on the ladder of American success. This role was crucial in an era when government safety nets were as yet largely unconstructed. Often enough, newer immigrants benefited from the generosity of other immigrants who had just a few years earlier achieved the American dream. In New York Haitian-born Pierre Toussaint (1766–1853), hairdresser to the wealthy, funded an orphanage, an employment agency, and a shelter for travelers. Beneficiary of a rich inheritance and operator of a successful bakery business, Irish-born widow Margaret Haughery (ca. 1814–1882) spent her wealth aiding the sick and poor of New Orleans. In St. Louis another Irish immigrant, merchant John Mullanphy (1758–1833), was sitting on a large fortune by the time the tidal wave of Irish immigration provoked by Ireland’s 1845–1852 potato famine arrived. Besides direct assistance to struggling immigrants, he built a convent for the Sisters of Loretto, a novitiate for the Society of Jesus, and a hospital for the Sisters of Charity. These and other congregations (groups) of male and female consecrated religious (members of orders of monks and nuns) became sources of workers for the charitable institutions springing up in America’s cities. But assistance from conventional charities was only one way in which poor Catholic immigrants coped with financial hardship. Mutual aid societies, by which neighbors of modest means would pool resources to provide for each other in times of need, became vitally important to immigrant communities. Some grew into large and sophisticated organizations that survive in modified form today—the Knights of Columbus, for example. Others were spontaneous efforts organized locally by individuals whose names have been lost to history. Their social concern gave rise to groups aiding members who experienced illness, unemployment, or death in their families. In 1891, for instance, the women of Holy Family parish in Chicago took up a collection to pay for the funeral of a mother of six children, and thereby brought into being the Women’s Catholic Order of Foresters. The overwhelming needs of fellow Catholics provided plenty of demand for the available services. But they were not limited to helping Catholics. During a cholera outbreak in Louisville in 1832, city fathers recruited the Sisters of Charity of Nazareth to care for the diseased, since no one else would do it. The Nazareth sisters and many other congregations opened the doors of their orphanages, schools, and hospitals to all comers, regardless of religion. Many Protestants first encountered Catholic sisters through this charitable work. These humble, diverse initiatives gradually grew. In 1910 many of them united in the National Conference of Catholic Charities (later Catholic Charities USA). By that time heavy Catholic immigration and the large Catholic families that soon resulted had helped to make the church a powerful political player. This was especially true in the big cities of the East and Midwest, where Catholics dominated urban politics. As government became a more active provider of charitable funds and assistance, Catholic organizations entered into cooperative arrangements with friendly local governments. And, as Catholic institutions grew into some of the largest and most respected providers of social assistance in the country, those arrangements extended to the state and national levels. This was a natural progression, but it came with a tradeoff. More centralized organization potentially compromised local initiative and flexibility. More government funding potentially restricted religious motivation and identity. Longstanding uneasiness with this situation reached a crescendo in the early twenty-first century, when charges of soft-pedaling church teaching and neglecting their spiritual mission forced some agencies to reform their policies and practices. Kevin Schmiesing is a research fellow at the Acton Institute.